The digitalisation of mines is a hot topic, and one that encompasses many technologies and beneficial outputs. Digitalisation relates to everything from big data, business intelligence and analytics, to automation, the Internet of Things (IoT), geo-location and more. The flavour of the month may vary depending on the latest trend or industry report, and each operation may choose to adopt one aspect or many. It is known that having a digital mine connecting assets, people, technology, processes, business strategy and operations is being embraced by the industry. 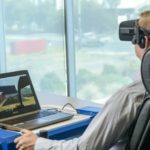 This is why MST Global has focussed its product roadmap over the last three years in developing a digital platform that can support all of these technologies specifically designed for the underground environment. A particular focus on making the platform practical to implement, maintain and extend for future capability was imperative. 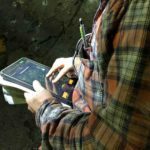 MST Global is the pioneer in digitising underground mining operations, having installed the first mine-wide Wi-Fi system at an underground mine in Canada in 2004. Bridging this experience, a new and improved product range, AXON, was developed. AXON is a system that moves well beyond providing simple applications such as tracking and voice communications. The product range is keeping a close eye on the future, with the modular design allowing various control and automation modules to be simply plugged in. This includes it being LTE ready, to simplify the deployment of LTE underground, particularly as 5G matures and some of the current constraints of using LTE underground are overcome. 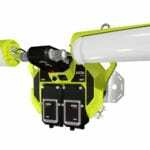 AXON is a digital platform that incorporates wireless and wired modules to ensure high-bandwidth connectivity throughout a mine. Maintaining communication with production machinery such as jumbos, loaders and trucks is vital in order to leverage the data from the equipment, apply advanced analytics, support fleet management systems (FMS) and push corrective actions and remote control back underground where it is needed. A critical part of this is making so-called ‘last mile’ connectivity easy to install and practical to maintain. 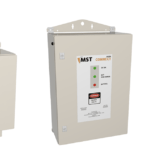 MST’s approach is a combination of ‘daisy chaining’ several AXON air access points (APs) via wired copper (PoE+) as well as wireless mesh connectivity via the Wireless Repeater Node (WRN) in very dynamic areas, where any type of cabling presents a challenge. By ensuring good data links to the face areas, equipment such as jumbos and loaders that are fitted with a Vehicle Intelligence Platform (VIP) data logger/Wi-Fi bridge can transmit a steady flow of real-time data between the machine and the surface. This data can then be used by drilling or productivity management systems to analyse performance and send updates and changes back to the equipment to ensure they are performing optimally. Complementing this advanced digital platform, MST has concurrently invested heavily software applications to allow monitoring and reporting to work with the network. From digitisation of forms through to workflow management, these software applications further leverage digitisation and deliver it to mines. Importantly, the platform remains completely open to other third-party applications and devices a mine operator may want to use. This combination of advanced networking and open protocols is why MST sees the AXON product range as a critical foundation for connecting mines to the future.